Paintshop > Advice > Better Brush. Better Results. What’s Nylyn? If you’ve seen one paint brush, you’ve seen them all right? Wrong! It turns out, you can reinvent the wheel, build a better mouse trap, make a better brush. One quality paint brush – well taken care of – can last a lifetime. Once you know how a better brush works, we promise you won’t go back. 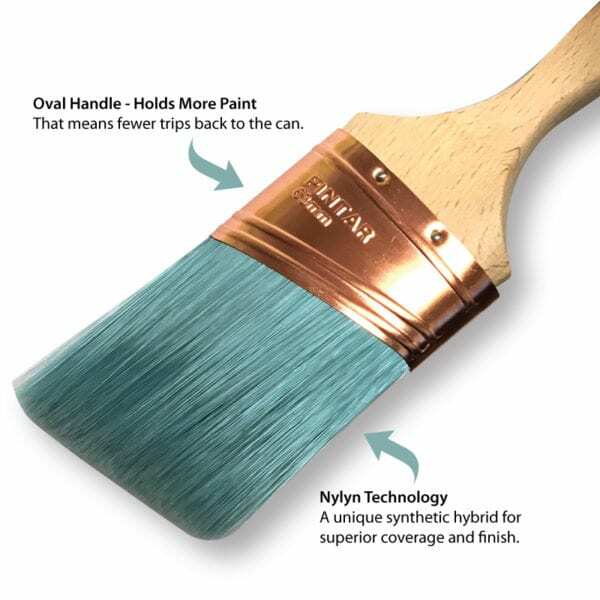 The latest addition to the applicators line up is a Paint Shop exclusive: Silks Oval Handled Paint Brush made with Nylyn Technology. What’s that, besides a mouthful? Nylyn is a step up from a traditional polynylon filament. Filament refers to a brush’s “bristles” and will affect how much paint is picked up, how clean a line is made and how many brushmarks are left behind. Softer bristles produce a smoother finish. You won’t find much smoother than nylyn.